• Why is the Medicine Buddha blue? 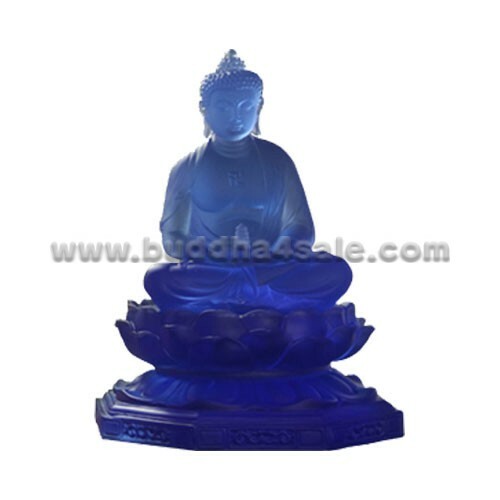 The deep blue that the Medicine Buddha is normally portrayed in wasn’t done so at random. It ties back a master healing stone – Lapis Lazuli. For more than six thousand years this stone has been honored and cherished as the most precious of stones. Valued even more than the diamond or gold. It may be because of how hard it is to obtain. Primarily mined in the Badakshan region of northeast Afghanistan, which is pretty much an inaccessible area located behind the Hindu Kush. This deep blue is usually associated with the brow chakra. The main attributes of the brow chakra are discernment, clarity, vision and seeing beyond illusion. • What is the plant that the Medicine Buddha is holding? • What does the Medicine Buddha’s hand gestures mean? The Medicine Buddha’s left hand gesture – resting in his lap, palm upward symbolizes meditative stability or meditation as a whole(See other Buddha Hand Mudras). Meditation is is looked upon as a tool to aid in the eradication of sickness and suffering. How? By digging deep into the very roots of samsara. This will lead the practitioner to the realization of absolute truth. Enlightenment. You’ll find a slight adaptation of the Medicine Buddha’s vows for the modern age below. “Commit not a single unwholesome act. We feel the formless stream of air at the tips of our noses and let thoughts and feelings pass without evaluation. Then we focus on the four basic thoughts that steer mind toward liberation and enlightenment. We recognize our precious opportunity in this life, that we can benefit countless beings through the method of a Buddha. We remember the impermanence of everything composite. Only the unlimited clear space of mind is lasting. We understand causality. That it’s up to us what will happen. Former thoughts words and actions became our present state and right now we are sowing the seeds for our future. Finally, we see the reasons for working with mind. Enlightenment is timeless highest bliss, and we cannot benefit others while confused or disturbed ourselves. Therefore we now open up to those who can teach us. For the good of all beings we take refuge: In the Buddha, mind’s full development, In the Teachings, which bring us there, In the Sangha, the Bodhisattva’s along the way. Now, out of space in front of us condenses the blue transparent form of the Healing Medicine Buddha, a radiant field of energy and light. His deep blue translucent form awakens minds deepest awareness. His face is radiant and mild. He see us, knows us, and wishes us everything good. His left hand, palm upward in his lap, holds a bowl full of miraculous healing nectar. His right hand rests palm outward on his knee in a blessing gesture, and holds a magic plant which cures all diseases. He is seated in meditation posture and is surrounded by light. 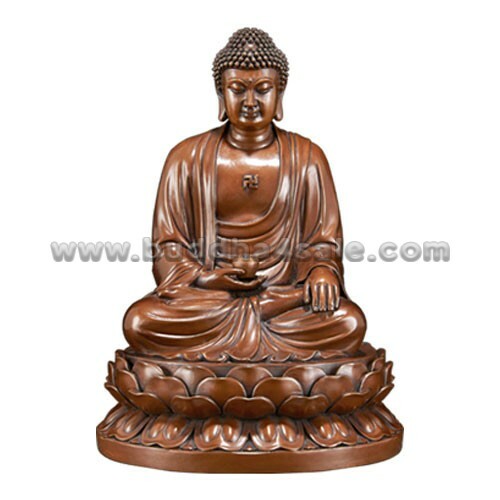 The Healing Buddha unites space and bliss and is the activity of all Buddhas. His deep blue radiant and holy body of Lapis Lazuli expresses omniscient wisdom and compassion inseparable. Healing Buddha we strongly wish to accomplish your enlightened and healing qualities for the benefit of all beings. The Healing Buddha knows our wish. He smiles and comes ever closer through space. He now remains at a pleasant distance in front of us. A strong clear light radiates from between the Healing Buddha’s eyebrows and enters the same place in our forehead. It fills our head with powerful clear light. The light dissolves all disturbing impressions in brain, nerves and senses. All causes and imprints of harmful actions disappear and our body relaxes. It becomes a conscious tool for protecting and helping others. We retain the clear light for as long as we wish and experience the inner vibration of the syllable OM. Emanating from The Healing Buddha’s throat, a radiant beam of red light streams out. It enters our mouth and throat and dissolves all difficulties in our speech. All impressions of harmful and confused words disappear and we become conscious of our speech. It is now compassion and wisdom, a powerful tool for benefiting others. Along with the red light, we retain the deep vibration of the syllable AH. From the heart level in the center of the Healing Buddha’s transparent body, an intense blue light shines out. It fills the middle of our chest. Everything harmful now leaves our mind. Disturbing feelings and stiff ideas dissolve and our mind becomes spontaneous joy. It is space and bliss inseparable. Together with the deep blue light vibrates the syllable HUNG. In front, the Medicine Buddha’s form dissolves into rainbow light. It falls on us, is everywhere and we feel peaceful and joyous. Now, all form disappears. There is now only awareness, with no center or limit. Thoughts and phenomena are the free play of space. Now our surroundings, this world and all worlds appear, perfect and pure. Every atom vibrates with joy and is kept together by love. Everything is fresh and meaningful, radiant with unlimited potential. Beings manifest, near and far. They are female or male Buddhas, whether they know it or not. Sounds are mantras and all thoughts wisdom, for the sole reason that they can happen. We feel our own body condense out of space. It is power and joy. Something essential has happened. Before, we were our body and thus vulnerable to old age, sickness, death and loss. Now we have our body. Body and speech are conscious tools for benefiting others. Our true essence, and we know that now, is the clear awareness just experienced. It was also present when there was no form. We decide to keep this understanding in all life’s situations and wish that the good impressions that just appeared become limitless. May they bring all beings the only lasting joy, that of knowing mind. Whatever merits were produced by this practice we dedicate to liberate and provide health and happiness to all beings.